A master of documentary theatre, Annabel Soutar draws on dialogue and text from everyday life to create her plays. In The Watershed, she uses her own family’s road trip and quest to find out more about the sudden closure of the Experimental Lakes Area (ELA), a research facility in Northern Ontario, as her starting point. Woven into this quest are news reports, interviews, and speeches from rallies and events that provide a broader context to the issue. Soutar was commissioned to write a play about water in Canada for the 2015 Pan American games in Toronto. As she began her research, the Harper government announced that it was planning to cut the funding for the ELA, and this became a focal point of the play. Her journey to figure out why the government decided to cut the finding for the ELA leads her to meet with activists, politicians, NGO and business leaders, and professors. She soon realizes that finding out the truth isn’t as simple as it should be — after all, her tax dollars paid for the ELA, and as a citizen she has a right to know why the decision was made to end the program. The issue is so political that once the government catches wind of her plan to write a play about the ELA, they question why they are funding her creation. Her co-producer warns her to “be strategic” and be careful how she talks about the project. Although this play deals with political and environmental issues, it contains many lighthearted moments thanks to the family story at the heart of everything. Soutar normally works on her research alone, but this time she and her husband decided to include their two daughters in the process to teach them about water. Maybe it’s because this play tries to do too many things at once or has too much source material to work from, but at two hours and 45 minutes (including intermission), it felt like it could have been trimmed down a bit. The investigative work is engaging and suspenseful as we learn more pieces of the puzzle behind the ELA closure, but there are many scenes at home or during the family road trip that could have been left out. There is perhaps too much detail, which is understandable when distilling weeks of research and recorded conversation into a condensed story. The set composed of pipes, wooden pallets, and bathroom fixtures was versatile and simple, allowing for a bathroom to quickly become a boardroom or an office to quickly become an outdoor scene at a lake. The projections on the brick wall at the back of the stage helped to provide context along with true-to-life sound design and setting titles telling us where and when we were, much like you might see in a film to help situate the viewer. After intermission the massive set was transformed into a Winnebago. The family drove from Montreal to Fort McMurray to see the tar sands for themselves and learn about their effect on our water. As you can imagine, the two girls and their friend who tags along provide much comedy in this second half of the play, especially when they do their first real interview at a diner and ask a worker from the tar sands if he’s ever put his hand in a tailing pond. The actors in this play (aside from the two playing Soutar and her husband) portray over fifty different characters ranging in age from eight to over 70. One minute they might be a politician or activist, and the next they might be a young Soutar daughter. For the most part, this was not distracting, but there were a few moments where we might have had to think twice to realize which character was speaking. What is most striking about this play is its authenticity. Using conversation and dialogue plucked straight from her own life, Soutar’s interactions with her husband and children are endearing and funny because we can see ourselves saying similar things and acting a similar way. Her father’s political views (Conservative) are contrasted with her own (undefined left-leaning) during a few conversations at family gatherings. Left out of the equation were responses from the other political parties, aside from a brief word from NDP MP Kennedy Stewart in the House of Commons. Did Elizabeth May not make any sort of statement about the closure of the ELA? What about a Liberal perspective? I find it hard to believe that those parties were silent on this issue, so why weren’t their views included? 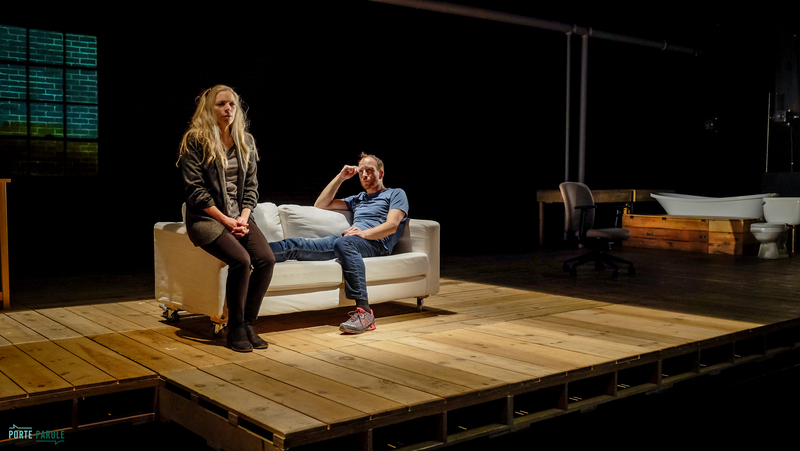 Although it seems clear what Soutar’s own views are on the issues presented, the play leaves the viewer to assess the situation and the heaps of information to come to our own conclusion. In this way, it felt like it lacked a true ending and a strong message for the audience to take home. Instead, we’re left floundering in a sea of uncertainty, feeling rather hopeless about the future as we ponder the fate of our water resources and our democratic institutions.